Born during the Great Depression, Mike Mahan was in many ways a very lucky boy. His parents, a barber and a beautician, owned their own shop and home, always providing ample food, clothing, and warmth. 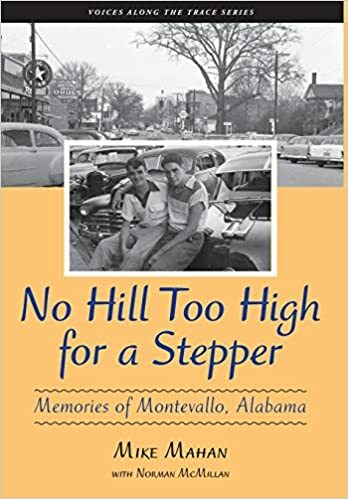 No Hill Too High for a Stepper is not, then, the usual story of economic or family struggle, but rather a celebration of life in Montevallo, Alabama, during the thirties, forties, and fifties. It paints excellent portraits of unusually supportive parents as well as of other family members and townspeople, creating a detailed sense of small-town life during this period. At the heart of this book is an absorbing depiction of an irrepressible child and adolescent who approached all of life with a great sense of wonder and who meant to live it to the fullest. Throughout the memoir, the reader comes to see the richness of this life and the pride with which Mahan remembers it.